Dear Ma - It has been so very long since I have either heard from or written to you that I scarcely know how to commence. I now write at a venture with very little hope of your ever seeing the letter; however I will do my best & if you do not receive this it will not be my fault. I should have written to you long before this but as I could receive no letters from you, I very naturally concluded that you could receive none from me & therefore it would be worse than useless to write. You have of course heard before this of the battle on Sunday last but I think it very doubtful if you know anything about it for as far as I am able to judge with its price as scarce in the Northern press as ever, & I suppose the mass of the people as much deceived; the battle was truly a terrible one, it lasted from eight in the morning till five in the evening. George was in the thickest of the fight but thank God he did not receive a scratch. He is a member of Col. Pendleton's Artillery. Our loss was great but to be compared with that of the enemy, We lost between four and five hundred killed and fifteen hundred wounded. The enemy left seven thousand dead and wounded upon the battle field, beside a thousand taken prisoner. We captured over thirty pieces of Artillery, six hundred tents, and a most incredible supply of arms and provisions. Truly it was a great victory and I pray God to make us thankful to Him for his great love and mercy towards us in delivering us from the horde of our enemies. My anxiousness about George was great indeed. I could learn nothing of or from him until Thursday morning, except that the regiment to which I supposed he belonged had been cut to pieces. You may imagine my suspense and anxiety. On Thursday I received a hurried line from him assuring me of his perfect safety. My heart overflowed with love and thanksgiving to my Heavenly Father for having spared my brother. It was indeed a great victory but there were many [broken] hearts in our country. Measuring our friends loss in that victory, poor Mr. Willie Lee was wounded desperately and when we heard it was thought he must die. God have mercy on his poor young wife. Tucker and Holmes Conrad of Martinsburg were shot dead side by side, the only sons of their father. Mr. Peyton Harrison of Martinsburg (Mr. Conrad's nephew) was killed. Also Lloyd Powell of Winchester (Nina's closest brother). When we think of all the sad and stricken hearts throughout the land, I am afraid there is danger of our forgetting God's kindness towards us in causing us to triumph over our blood thirsty enemies. But I pray that he will give us humbly thankful hearts. I should think if he people of the North will possibly _?_ as the North in this battle it would prove to them the utter folly of attempting to conquer the South. _?_ have men fought desperately against fearful odds. 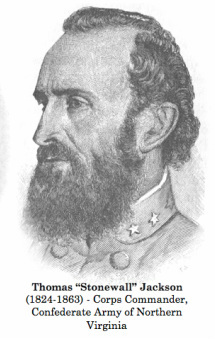 Cousin Edwin Lee (who was in the midst of the fight as Gen. Jackson's Aide) says we had never more than twenty thousand engaged at one time, while the number of the enemy as stated in the papers was fifty-three thousand. I am most pleasantly situated here with Cousin Lee and his family. I met with nothing but kindness and affection from all and it was not for this horrible war, I should be quite happy. I am convinced now that unless we forget our God in the pride of our victory and thus cause him to forsake us that we have nothing to fear from our enemies for our men will fight till the last man is killed rather than sustain a defeat by such foes. This outrages and atrocities committed here, are outrageous of course you hear nothing of them where you are. Cousin Lee heard from _?_ the other day. She is in Middleburg with Nita. Aunt Chattie [Charlotte Rust], Grandma and Uncle George's wife all well. Aunt Ginnie is near Upperville. Uncle Armistead [Rust] and Uncle George are in Leesburg Col and Lt Col of the militia. I have a long letter from Trent the other day, all well at Bedford. He had just heard from you. It is perfectly outrageous about Aunt Susan. I give praise she is wholly lost to us. I think she knows how I feel towards her Nation and _?_ shameful. I am glad we have no connection with it, but, I will endeavor to control feeling and not give you the benefit of them. I do wish you would come home. I expect you can do so with perfect safety. Thence _?_ to you mother and sisters. Cousin Lee sends love. I wish you could come home. [Note: The letter above to "Ma" is from Virginia (Diddy) Bedinger to her stepmother, Caroline Bowne (Lawrence) Bedinger in Long Island. Caroline had moved to Long Island, New York, presumably intending to spend the duration of the war in safety near her relatives there. Letters of the Lawrence’s document this. Virginia is asking her to come "Home", to Shepherdstown.